GREAT INSTINCTS = GREAT ATTITUDE = GREAT PERFORMANCE! First time here? Get started with the About page and Module Guide. Question Gus was asked on Quora today: Is ‘getting bored’ a survival instinct? His reply: I can understand how you could have a question about this. On the face of it, it’s difficult to see how boredom could have evolved as a pro-survival emotion or attitude. The thing to appreciate, though, is that no single attitude or emotion is useful or helpful in all situations. There is no universally “right” or positive attitude. Even the human attitudes that are most commonly welcomed—like friendliness, kindness, confidence, courage, love, etc—can get you into a lot of trouble when they are instinctively triggered in the wrong circumstances. Continuing to be friendly to people who are actively trying to do you harm is simply self-destructive. Being kind to those who are harming others is socially destructive. Confidently proceeding on a course of action when you haven’t first determined the risks could wind you up in a wheelchair—or with a Darwin award. Continuing to love someone who is too self-absorbed to love you back in the same way can ruin your life. And so on. Boredom results when a person is reacting with a passive attitude to circumstances that really call for a more responsive or proactive attitude. For instance, when your intuition is just to observe what’s going on, but there is nothing much going on, then you will end up feeling bored. However, if you were in the middle of a riot, the instinct to just passively observe what’s going on—rather than get swept up in the hysteria of the moment—would be a very pro-survival reaction. It would allow you to see dangers coming and so avoid them. The survival value of any human emotion or attitude lies in its appropriateness to current circumstances. Psychologists call this aspect of mental operation: relevance. The human brain has evolved to produce relevant instinctive reactions, but it is certainly not perfect at this. All human reactions are potentially relevant responses in various types of scenarios, however the more violent reactions are less likely to be useful in a modern civilized setting. Whenever you feel disappointed in a situation, or whatever you are trying to do continues to feel difficult: this happens because your intuition is continuing to urge you to react to the situation you are facing in a way that is not sufficiently relevant to circumstances. In which case, you have to find a better way to look at what is going on, one that is more relevant and thus more likely to lead you to bring about a positive outcome. In most cases involving persisting boredom, this means giving yourself more permission to a) focus on your own desires instead of going along with what you might think is the “right thing”, or b) lighten up, forget about problem-solving and see what would give you pleasure in the current situation—and “pro-act” accordingly. Instinx Performance Coaching progressively and permanently improves the relevance of your instinctive reactions—thus transforming your ability to achieve what you want. Question Gus was asked on Quora today: How is motivation the key to success? Reply: Motivation alone is NOT the key to success. It certainly helps to be motivated. You are unlikely to achieve much without a sturdy motivation pushing you along your chosen path, but motivation only turns into actual desired results when it is backed up by personal ability. Attitudes which influence ability to work (and play) arise from two complementary but distinct mental processes: 1) natural aptitude (talent) for the tasks involved, and 2) degree of motivation to engage in some activity. Though motivation is a mental state, it’s influenced more by external reinforcement than by internal factors: encouragement, acceptance from others, desirable outcomes, shared visions, peer pressure, threats, things like that. So also is motivation weakened by opposing external influences such as discouragement, rejection, undesirable outcomes, lack of results, disagreement, etc. Being so easily affected by such a var­iety of inputs, motivation is relat­ive­­ly easy to raise in the short term. That’s why it gets the lion’s share of attention from most motivational gurus. It’s just not that hard to rev up a person’s motivation in the short term. But motivating alone does not impart lasting improvement in a per­son’s ability to perform. To ensure their gain is stable and permanent, you must improve aptitude as well, which is a much tougher nut to crack: because aptitude derives from an inner instinctive source. People unconsciously prac­tice an in­stinct­ive selectivity toward how they go about things and it is these natural inclinations that determine how easy or difficult any activity feels. The more instinctive apt­itude you have for some­thing, the easier you find it to do. The less you have, the more difficult and daunting a task feels. Gaining skill is supposed to make some desired result less difficult to achieve: that’s what the entire education industry wants us to believe. And it should also have an improving effect on attitude too: giving more confidence, for instance. But the truth is that con­sciously improving skill only im­pacts on perform­ance to the degree your instinctive aptitude allows it. The way Nature has designed things, instincts trump knowhow. We humans tend to think our intellect has learned to keep our instincts in check, but this entire dichotomy is constructed of instinctive processes. On an individual basis, we only act more civilized to the degree our instinctive aptitude translates that civilizing knowhow into action. When it doesn’t—when “what’s appropriate” is not apparent or feels difficult to conform to—we resort to older, less acceptable behaviours … which often get us into trouble. The natural inclinations of aptitude com­prise not only a special ability, but also a special awareness of where that ability will be useful. So, when a situation calls for your high­est aptitude, it is also most obvious to you what is needed; and you are astonished it’s not obvious to others. But when aptitudes you don’t possess are what’s needed, you’re the one who is oblivious to what the situation really calls for and that blind­ness will aston­ish others. So you exhibit the most intelligence where you have the highest aptitude; and the least where it’s lowest. You find it easiest to concentrate when employing your highest aptitudes—and concentrate for longer; while attention span is shortest where your aptitude is lowest. Your memory works best with regard to your highest aptitude; and worst with your lowest. You make the least mistakes where aptitude is high; and the most where it’s low. Most important of all, you find it easiest to learn and improve your perform­ance where your aptitude is highest; and find it most difficult to improve where it is lowest. Aptitude could be likened to the ins­tinctive horse­power you bring to a task: like the output of a motor determining how much work a vehicle can perform. Yes, changing other things in a vehicle can make it per­form better—just as knowhowand other fac­tors can be improved to affect human perform­ance—but the underly­ing capacity of the motor itself is always the base one builds upon. Clearly, it is harder to sustain mot­ivation for things you find it difficult to do. And, of course, it’s easier to stay motivated about things that come easily to you. This is the real reason why most attitude-change benefits don’t last: they fail to affect the preferences controlled by one’s underlying instinctive aptitudes. Conversely, your performance “sweet spot”—where you find it easiest to get into ‘the zone’ and stay there—is when passion (motivation) and talent (aptitude) join hands. Then suddenly you find yourself accomplish­ing things you didn’t even know you were capable of. Excerpt © 2009 by A S Griffin. Question Gus was asked on Quora today: How do you “fill yourself” when you feel empty? Reply: I’ve been asked to answer this question which already has over one hundred answers. Apparently, the requester is looking for something more than has already been offered. I deal with this kind of problem routinely in my coaching practice, but this isn’t the usual sort of question I try to answer on Quora because there is not enough information to make a proper diagnosis of what is causing the person to feel empty in the first place. “Empty” in the mind is an absence of something, not just anything. In other words, the word tends to suggest a nothingness, a void that could be filled with a variety of things. but that’s not how the mind works. Emptiness in the mind is the absence of something desired. It could mean: I’m sick of overthinking things and I just want to take action. But it could also mean: I can’t help seeing life as a succession of problems to solve when what I really need to do is lighten up and take more pleasure in things. It could also just mean: I’m lonely. Or: I’m out of touch with what I want. I could easily list a dozen more possible interpretations as well. So emptiness is an absence of something desired, even if what you desire is simply to be able to desire – to feel passionate about achieving something, for instance. This is something anyone’s intuition can know. “Filling yourself” will mean different things to different people. Once you have clarified your personal antidote to emptiness, then you can focus your attention on obtaining it, on finding ways to give this to yourself. But first you have to get this clearly in your sights so that you can focus on it. That alone will begin to allay your sense of emptiness to some degree. Only a few of Gus’s answers on Quora have been copied to this blog. To see more of his material on Quora click here. Question Gus was asked on Quora today: What makes people mentally strong? Reply: Is it the design of a bridge, for example, that makes it strong? The way it harmonises with the forces of Nature rather than defies them? Or is it the quality of the materials that went into its construction? Or is it the quality of workmanship (workpersonship?) that knits the whole thing together? There are always several dimensions that contribute to the “strength” of any functional aspect of living. 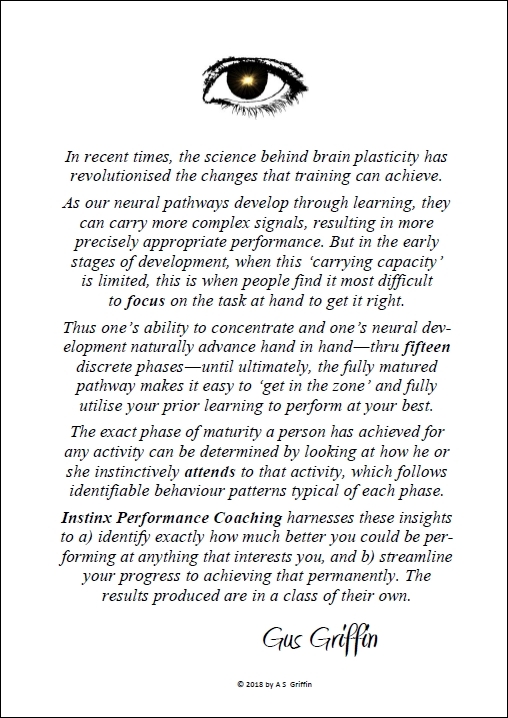 This is what produces the focused, resilient individual: who finds it relatively easy to get “into the zone” where he or she can make best use of their faculties and so perform at their best. However, breadth of stimulus and experience plays an important role in determining when a person can be strong as well. People who develop their abilities along too narrow a spectrum, such as overly focused athletes, may too easily find themselves at a loss when confronted with situations which lay outside their normal experience. So they can only display “mental strength” in a limited range of situations. Their experience has not been varied enough to permit them to adapt to novel situations readily. So one’s mental strength is partly a function of one’s current environment. It is not as easy to access one’s mental strength in unfamiliar surrounding as it is in familiar ones. On the other hand, a person who is used to encountering unfamiliar situations may find it easier to access their strength than when they are confronted by the routine. Hence extreme sportspeople, for example, are at their happiest and best when having to respond to the unexpected. If you’re looking for a simple answer which distils down the functional essence of what makes a person strong, able to prevail in life’s situations without too much difficulty—or by overcoming great difficulty—then the answer would have to be: adaptability. It is well established in zoology that this is what determines the viability of a species as well as the viability of any organism within that species, more than any other factor. How well can you find ways to adapt to new situations and requirements and challenges—or find ways to stably adapt your environment to your own requirements? That is what determines mental strength and resilience more than any other single factor. Which begs the question: What determines how adaptable a person can be? This is what I have been researching at a practical level for the past 30 years. And the short answer is: the command a person has over their own attention. How well he or she can focus where they want to, when they want to and to the degree of concentration they want to. Conversely, what makes a person mentally weak is the opposite: avoidance and obsession, where a person’s finds their attention not under their own control, but is “taken” by things you can’t help thinking about, or resists focusing on what you should or could be focusing on to get better results. Whenever you encounter persisting difficulty at doing something, or continue to feel disappointed about some aspect of your life, your ability to attend to that aspect of life needs to be boosted. When that happens, suddenly everything feels easier to cope with. Question Gus was asked on Quora today: How is helplessness a learned behavior? Reply: Learned helplessness is simply a habit of avoiding difficulty. If you are rescued every time you start to manifest the frustrations and discomforts of experiencing difficulty and disappointment, then you will soon learn to fold quickly all by yourself without any prompting from anyone else. On the other hand, if you are expected and encouraged to persist in trying to overcome difficulty whenever you encounter it, then you will end up with a superior ability to adapt and thus be set up for life. One caveat to this is, however, that it is much more helpful to prompt people to overcome difficulty in the areas of their strengths (naturally high aptitude areas) as contrasted with their weaknesses (naturally low aptitude areas). Continuing to demand that someone persist at activities he or she genuinely has no aptitude or passion for can be quite soul-destroying and destructive of self-esteem. The kid might not be the “chip off the old block” you’d like to think they are. 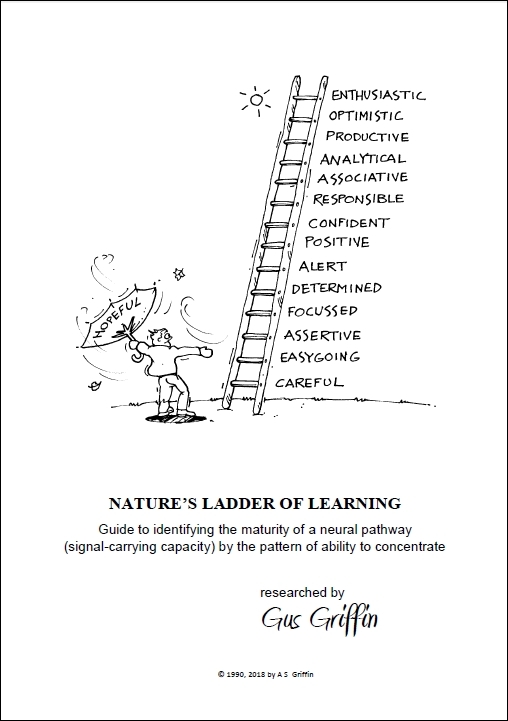 You need to learn how to recognise their natural inclinations and encourage them to develop in those directions. It’s never too late in life to start doing this with anyone—regardless of their age they will immediately begin to benefit . It is great to point out confirmation bias, especially when it’s done in such a charming way. It’s important for people to know about this. However, when it is presented as a flaw or something to be overcome, its greater value is being overlooked. Looking at this from an evolutionary perspective helps to reveal the utility in this natural instinctive response in humans. If we are all influenced by confirmation bias on a daily, hourly basis, then surely it must have been selected for its survival value. If it happens for a good reason, then perhaps it is something which can be harnessed rather than suppressed. As pointed out, “seeing” what you expect to see can work for you or against you. An upside, for instance, is recognising opportunities because you expect them to show up. A more fundamental truth is that what we see is always a product of our imagination. Our senses take in the available information and our brain processes the data into a conception of the whole. If this conception reasonably resembles objective reality then we don’t bump into walls, get run over by busses or needlessly rub people up the wrong way. But it is still and inevitably our own unique subjective version of reality, for better or worse. It takes time for the brain to build up the layers of integrated information needed to ultimately make up a conscious and functional view of the world. This interval is measured in milliseconds, not seconds, but in neurological terms we are still talking about fifty iterations or more needed to tweak what we are seeing into something really worth thinking about. And while this mental constructing is proceeding (roughly within the blink of an eye), it is up to our “unthinking” instinctive reactions to keep us alive and our relationships intact in the meantime. Here’s where confirmation bias comes in handy. It helps to look at instincts as “preconscious” responses. They are the rapid-response faculty of the mind, happening faster than conscious thought. In the same way that firemen “expect” fires to happen, or police expect crimes to occur, specific instincts also anticipate things happening “out there”: so your system is primed to respond instantly and effectively when they do. Whenever you undertake something new and unfamiliar, like yoga … or a first date … or asking for a raise … or snake-handling … it is your danger instinct (fear/preventing) which is cued for instant response. It may be your curiosity or your appetite for risk or opportunity that has prompted you to venture into this unmapped territory, but as soon as you do, it is your native caution that comes to the fore to protect you while your brain is busily processing the extra load of identifying new patterns and matching them with familiar ones. That’s why our confirmation bias often seems negative at the beginning of things. It is — it’s hyper-alert for the unsuspected danger. The unfamiliar is guilty until proven innocent. This bias has protected our particular branch of evolution through millions of years of exploration and experimentation, while other branches have become extinct under the same conditions. If actual threats don’t materialise in due course, giving the conscious mind enough time to identify value in the new activity/terrain, then your instincts automatically “switch gears”: cuing up a more accepting attitude which seeks and finds ways to “fit in” instead (as opposed to being poised to “bug out” at the first excuse). As further conscious experience is gained, then the “bias gearshift” switches again, cueing up a more assertive approach to mining value here — and so on through a hard-wired sequence of instinctive biasses (automatic unthinking/intuitive precedents) prioritising the natural learning process as familiarity grows. In all, 15 different instinctive human biasses (prompting filters) may be preconsciously adopted in this way. This is much more than any other animal possesses and accounts for the sophisticated learning and adapting of which humans are capable. So that’s why confirmation bias actually exists in humans (or any other organism, for that matter). It is our NORAD — our early warning response system — which goes through a series of “alert phases” while our conscious mind finds out what it wants to find out. This only becomes a problem when a particular instinctive response becomes habitual — mistakenly applied all of the time to a whole class of situations, instead of appropriately to the current situation. Phobias, addictions, compulsions — any hangup really — all fall under this heading. Only then does confirmation bias truly get in the way. The rest of the time it is helping us through the day. I thought this might be of interest. As a Performance Coach, I have been investigating how to harness and troubleshoot confirmation bias (instinctive responses) to permanently improve performance for the past 27 years (instinx.com). Question from Quora today: What’s the one, single thing someone has to keep in mind to become a good adult? Looking at the other answers so far, none of which give you the “one single thing” you asked for, I’m tempted to say: Listen! Hear what people actually say, not what you want to think they said. But I’ve got a better one than that, which is: build trust. You could call this collection a little primer on building trust. I hope you find you can do something with it. At first I passed on this question – examples are too easy to find for oneself. But then I remembered an interesting example of this in most snakes which isn’t well known. Most people who get bit by snakes are stupidly attacking the snakes at the time. So you can hardly blame the snake for attacking back. But not all of these people were being as stupid as you might think. Sometimes it looks like you don’t have any choice but to get the snake before it gets you – which is actually caused by a common misunderstanding. However, most snakes are not “running from” in their attempts to flee; they don’t just flee “away” from the threat in whatever seems the easiest direction. Their instincts are not flexible (adaptable) enough for that. They are actually “running to” their home. Yes, their flight instinct is specifically to run away to their safe zone which is their lair. So their particular flight instinct is fused or conflated with their homing instinct. This particular survival mechanism has been serving most snake species well now for millions and millions of years. But snakes aren’t real bright: they have a very limited capacity for adapting their instinctive reactions to circumstances. So “go home” to a snake doesn’t mean “find your way home by the easiest means” or “keep going in the general direction of home but detour around threats and obstacles on the way”. No, they haven’t got the brains for that level of sophistication. Therefore, if you happen to be situated between the snake and its home when you accidentally (or deliberately) make it feel threatened, it will appear to be attacking you even when it is actually trying to get away from you. It can only go straight home and if “straight home” is on the other side of you, then it will try to go through you to get home. So it’s particular form of “flighting” makes it look like it’s “fighting”. Of course, the flighting instinct does switch gears to the fighting instinct at the moment it can no longer obey the “go home” command. Fight is the alternate command when flight seems impossible. In this situation, many people think they have no option but to fight back – and so many of them end up getting bit. Which they could have avoided easily, if he or she only knew that just a little bit of “snakely courtesy” was in order. All the attacked person really needed to do was step to the side and the snake would have slithered past with relief on its direct path home. Something to keep in mind the next time you go out bushwalking. Even more useful than a compression bandage and a cellphone.